Quietly nestled away about a mile northwesterly of the Village of Fort Plain lies the site of the original Reformed Church of Fort Plain. In the summer of 2005, a lone gravestone was all that remained to mark its location. Its Cemetery, wherein lies at least 952 local citizens, has been desecrated and nearly destroyed. Until recently its site had been lost, but not forgotten. A new spark has been ignited to save it. The Church was born out of a desire of the local residents to have a House of Worship at what was then known as “Canajoharie”. On September 9, 1761, the Reverend John Caspar Lappius, William Seeber, and Adam Young, all members of the Reformed Faith applied for a licence to collect money to build and operate a church. And, on that same date it is noted that Adam Young and Messrs. Bleeker had donated a ten acre tract of land in Expense Lot A of the Rutger Bleeker Patent on which to place it. After its construction the church stood quietly upon Sand Hill near the intersection of a new road to the Little Falls and the “King’s Highway.“ Then on November 14th, 1778, a British force under Captain Joseph Brant approached Fort Plank and many of the area inhabitants fled to the Church for safety (Maus Van Vranken, RWPA #W15970). Nothing more is said of the Church until August 2nd, 1780, when British forces, again led by Brant, attacked “Fort Plank.” Brant’s original intent on that date was to destroy only the fortress, but due to the presence of a blockhouse with two mounted cannon, the marauder made due with destroying the settlement and its environs (Haldimand Papers Add Mss 21767:109). It is believed that on this date all of the church’s records where destroyed [later records are found in the Utica Public Library], yet, a vague possibility exists that some area church records were preserved. On September 1, 1780, the Reverend Henry Melchior Muhlenberg noted that the Reverend Charles Solomon Friderici, a Hessian Army deserter, whom had been administering to the inhabitants of Canajoharie, Stone Arabia, and “the Falls” since 1777, had arrived in Easton, Pennsylvania after having been driven out by the British. Muhlenburg also reports that on the 16th of September 1780, he received word of the destruction of the German settlement at “Canotchiochery” settlement and its church. Even with its destruction, the site of the church remained, however, an area landmark with troops destined from “Canajoharie” to [New] Fort Schuyler proceeding by way of the road on which the church formerly stood (Benjamin Talmadge’s Orderly Book). By 1788, the church is believed to have been rebuilt on its former site as area maps from both before and after the 1780 Raid show the Church edifice at approximately the same Sand Hill location. Nothing of significance is noted to have occurred at the church until the first Tuesday in September 1803, when the membership of the German Reformed Congregation of Fort Plain applied for admission into “the Classic of Montgomery”. Problems were noted to have existed between the “Mother Church” and the local congregation, but by the January31, 1809, the church was admitted to the Classis with a letter of warning to the church’s congregation. A few short years later, an animosity developed between the minister, John J. Wack, and the Classis of Montgomery, and the pastor was defrocked. As a result, an 1832 committee which was chaired by Ransford Wells and to which belonged John Frey, was appointed by the Classis to investigate the congregations of Palatine and Fort Plain. 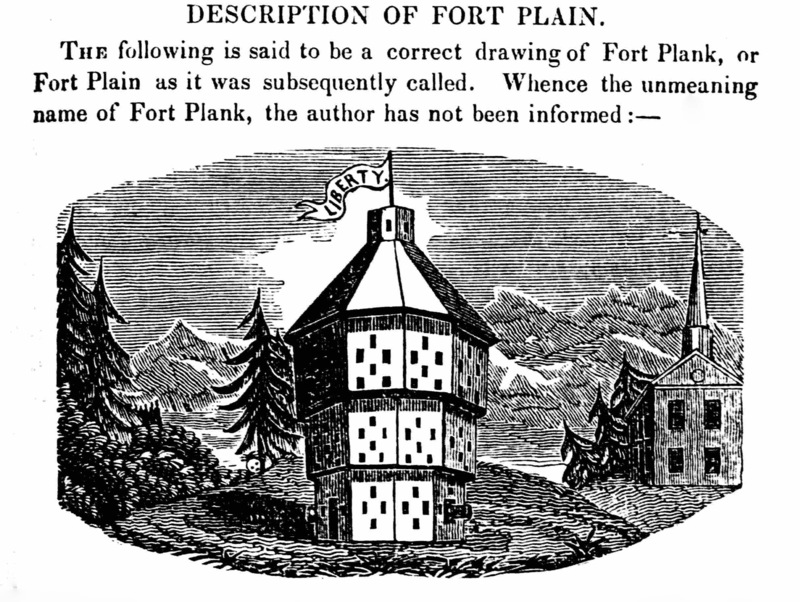 It was noted in their ensuing report that the church at Fort Plain had been allowed to fall into ruins. It was also recommended. that the affiliation of the “old” Fort Plain Consistory with the Classic of Montgomery be terminated. The report did however note that a new Congregation had been formed by the Missionary Society upon the grounds of the “Old Church” and merited the support of the Classis. The recommendations of the committee seemed to have mattered little, as by the time of their report the title to all of the lands of the “German Reformed Church” had been transferred into the hands of Reverend Wack. And, on July 23, 1832, Wack himself, lost possession to the Church’s properties by virtue of a Sheriff’s Sale to Peter Harder (Montgomery County Clerk’s Office). In 1833 & 1834, Harder apparently having no immediate need for the property, sold to Jacob Abeel, Junior all of that track of land “commonly called the Fort Plain Church Lot” with the exception of one square acre upon which the “schoolhouse stands;” three-fourths of an acre on which the church stood; and the “Burial Grounds” and the a private road leading to the cemetery. Harder later sold the schoolhouse and grounds as well as the Church grounds to John J. Lipe, exempting the right of dismantling the church sanctuary and the wall on which stood to David Diefendorf. Harder apparently had personal ties to the burial grounds of the church as the aforementioned deeds refer to the cemetery as still being the property of the now defunct church. And, on February 12, 1838, Harder transferred his title to the “Burial Grounds” and a road leading therefrom to the care of the “Trustees of the Village of Fort Plain” for the sum of $10.00, noting that The grant is made explicitly as a cemetery or burial ground. Resolved that Urilus Birge Superintend & have the Old Burying ground lot of the Village of Fort Plain Surveyed & Staked, out, which was conveyed to said Village by Peter Harder on the 12th of February 1838 the Same being that portion of ground connected with the old Fort Plain Church containing about 3 or 4 acres & a right of Way Unto the same having been deeded for burial ground purposes. In the summer of 1846, The Village of Fort Plain purchased a portion of Expense Lot B of the Rutger Bleeker Patent for usage as a “new” village burial ground from Joseph Wagner, Junior. Apparently this new cemetery was named “The Mont-Auban Cemetery” for that is how it is labeled on an 1852 survey of the Village Fort Plain (Fort Plain Museum). It is not known how long burials continued in the “Old Burial Ground”. It might be fair, however, to assume that it took two to three months for the new burial grounds to be surveyed, plotted, and opened for internments. Over the succeeding years additions have been made to the Mont-Auban Cemetery and it now reaches as far northwesterly as the Expense Lot B lands of Revolutionary War Captain Adam Lipe. An ordinance to prevent trespass &c on the Village Buriel ground passed by the Trustees of the Village of Fort Plain April 6" 1854. 1st. That from and after this date, all persons are hereby prohibited from tresspassing in any wise upon the village Buriel Ground by breaking, plucking, picking, cutting or carrying away any tree, root, shrub, flower, or grass which may be there planted, sowed or growing,, without having first obtained the permission of the owner thereof, if private property, and of the Trustees of the Village if public property. 2. That all persons are hereby prohibited from arid in any wise defacing marking - cutting or injuring any of the Monument, tomb Stones, public or private improvements or ornaments, or the public buildings or their fixtures, or the public fences, situated in, connected with or surrounding the village buriel ground. 3.That all persons are hereby prohibited from committing any nuisance, upon in or about the said burial ground. Very little can be found concerning the burial lands of the Reformed German Church of Canajoharie after 1854, except for in the deeding of adjoining lands, and the 1953 NYS Thruway Appropriations Maps showing the “Old Cemetery” as the “The Village of Fort Plain Cemetery”. In August of 1973, Laura Bowman and Helen B. Fyvie that noted that eleven headstones were still standing in the graveyard on Sand Hill. The families represented were: Diefendorf; Miller; Mathise; Crouse; Moyer; and Walrath. When asked about these in 1986, Raymand Luft and Douglas Ayres both responded with the news that in the 1940's a neighboring farmer had removed scores of headstones for use in constructing a cellar floor & some sidewalks, and to fill in some muddy cow paths. Between 1973 and 1986, ten of the eleven remaining stones had either sank from view or been removed. All lost, but not forgotten! Today the Reformed German Church Cemetery lies quietly hidden away a few score yards north of NYS Route 5S on Sand Hill about one half mile west of the village. Only the gravestone of Montgomery County Militia Colonel Robert McFarlan remains. It is hoped that someday this graveyard can be added to The National Park Systems Register of Historical Places and rededicated as a “Memorial Park” in memory of the numerous “Unknown Revolutionary War Partisans of Minden Township” whom lie within its nestling ground. More on the history of other early area congregations can be learned from “The Vosburgh Transcripts” in the New York Genealogical & Biographical Records Library in New York City, New York. The remains of the Reformed German Church of Canajoharie’s original records are housed within the Utica, New York Public Library.